Chewie and Han - friends to the end. A New Hope paper print from artist Christopher Clark! Hand-numbered limited edition of only 150 pieces! Measures 19-inches tall x 13-inches wide. Space smugglers, comrades in arms, friends to the end. Chewbacca and Han Solo secured a place in our hearts, and now you can give them a place of honor in your home or office with this stunning A New Hope interpretive artwork from artist Christopher Clark. 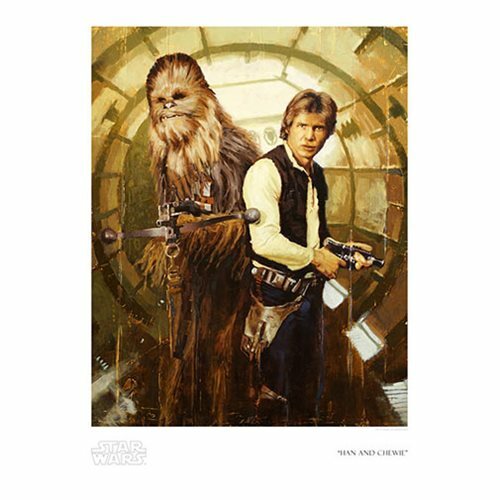 The unframed Star Wars Han and Chewie by Christopher Clark Paper Giclee Art Print is a hand-numbered limited edition of only 150 pieces, signed by the artist! Measuring 19-inches tall x 13-inches wide (image size 15 1/5-inches x 12-inches), it comes with a certificate of authenticity.